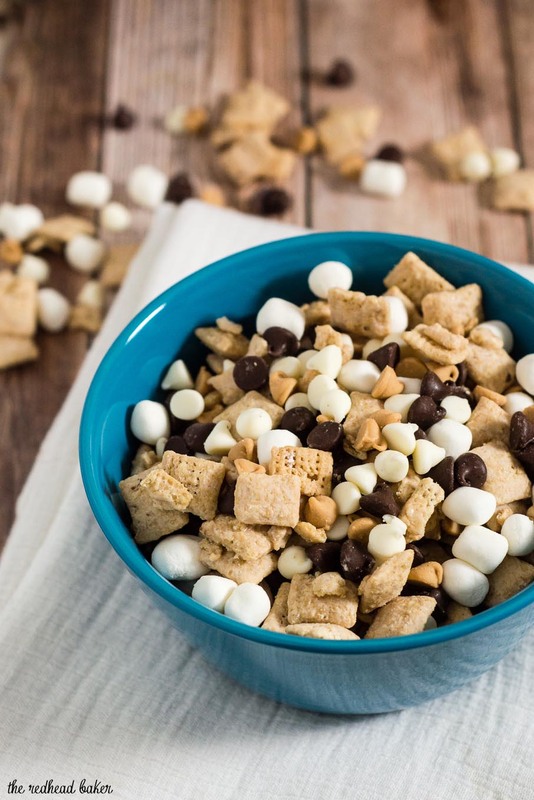 Avalanche Bark Muddy Buddies are based on a treat from the Rocky Mountain Chocolate Factory, and combine Chex cereal, peanut butter, white chocolate, semisweet chocolate and marshmallows in an addictive snack! The summer after I graduated high school, I worked at a local outlet mall, currently called Philadelphia Mills, though at the time it was called Franklin Mills. I worked in the Boscov’s, in the ladies department. On my lunch break, I’d go out of the department store and around the corner to a little shop called Rocky Mountain Chocolate Factory. Oh how I miss my teenage metabolism! The store sold all kinds of delicious treats, like chocolate-covered peanut butter cups, delicious fudge, and the most extravagant caramel apples. But my favorite treat was the avalanche bark: crispy rice bars made with white chocolate and peanut butter, with chocolate chips and marshmallows mixed in. The Rocky Mountain store only lasted about a year in that mall. 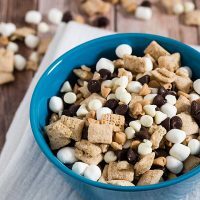 I still think about that avalanche bark to this day, and though they sound simple enough to recreate at home, I thought it would be fun (and even easier) to turn those flavors into the Chex cereal-based treat, Muddy Buddies (also known as Puppy Chow to some). The mix reminds me so much of the avalanche bark that I used to eat, but it doesn’t rip up the roof of my mouth like the crispy rice cereal bar used to do. 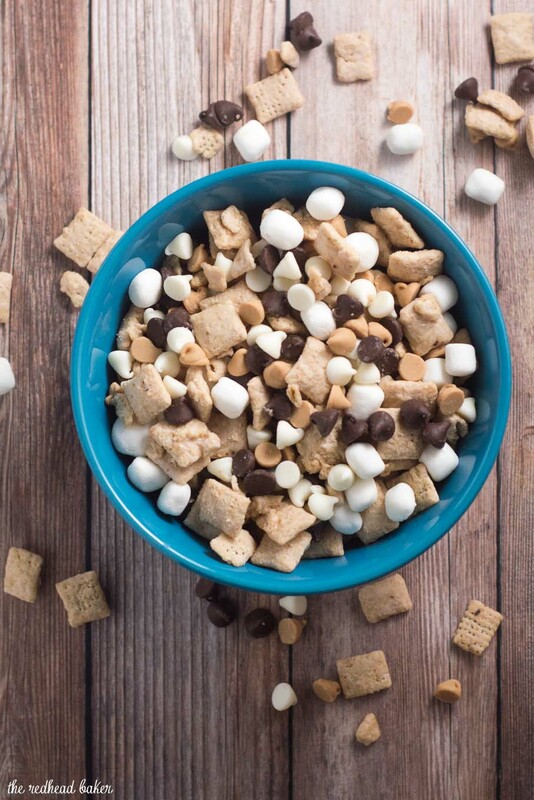 These Muddy Buddies are easy to make in small batches for a family snack, or make in large quantities for a party treat. The hardest part of this recipe is trying to restrain yourself from eating the entire batch by yourself in one sitting. 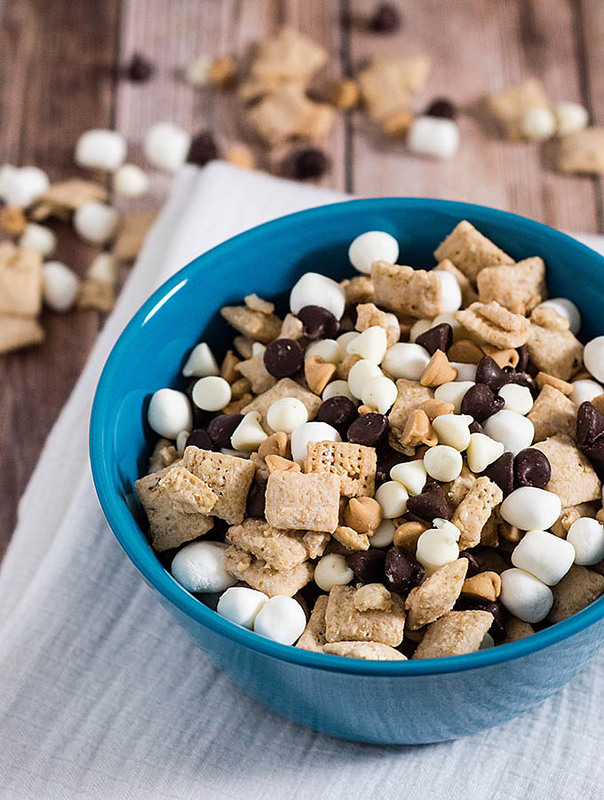 Pin this recipe for Avalanche Bark Muddy Buddies for later! Place the 1/3 cup white chocolate chips, peanut butter and butter in a microwave-safe dish. Heat on HIGH for 1 minute. Stir until smooth. Place the Chex cereal in a 1-gallon zip-top plastic bag. Pour the peanut butter mixture over the cereal, seal the bag and shake until the cereal is coated. Add 1/2 cup powdered sugar to the bag and shake to coat again. 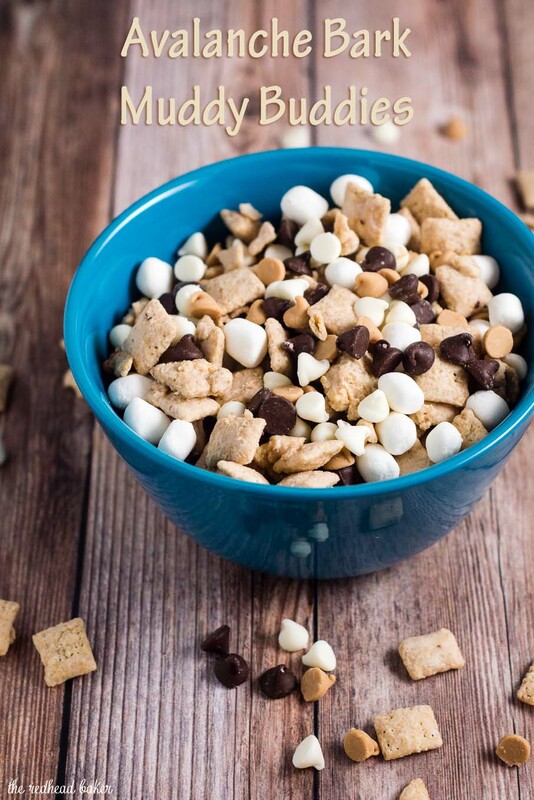 Pour the coated cereal into a large mixing bowl. Add the 1/2 cup each white chocolate chips, mini marshmallows, semisweet chocolate chips and peanut butter chips. Gently toss to mix. Store in a plastic zip-top bag for up to a week.